In January 2014, the Government proposed that there should be a professional duty of candour for health professionals. This was in response to the Mid Staffordshire NHS Foundation Trust Public Inquiry, carried out by Robert Francis QC, which published its final report in February 2013. The Francis Inquiry found evidence that, when patients come to harm, insensitive handling and poor communication after the event can be as damaging as the original problem. It identified that clinicians and clinical staff must be properly supported when things go wrong, so they will never feel prevented from being open and honest with patients or fulfilling their duty of care. ‘Every healthcare professional must be open and honest with patients when something goes wrong with their treatment or care which causes, or has the potential to cause, harm or distress. explain fully to the patient (or, where appropriate, the patient’s advocate, carer or family) the short and long term effects of what has happened. The duty of candour is common across healthcare professions, but it is recognised that different health professions and their regulators work in different ways – for example, the management and working relationships in osteopathic practice settings are very different from those in NHS hospitals. 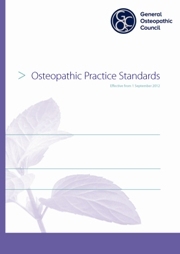 We will work with the osteopathic profession and with the other regulators to ensure that standards promoting candour are appropriate to osteopathic practice and consistent with other health practices. But the professional duty of candour expects health professionals to be more proactive: telling patients when something has gone wrong, rather than simply responding to complaints.